The philosophy behind strategic philanthropy is that by implementing important core principles - commit to clear goals, data-driven strategies, heightened accountability, and rigorous evaluations –there will be more successful outcomes. Sounds good. This is the approach that has been adopted by many foundations and individual philanthropists who have been advised on how to approach philanthropy. A new article on this subject in the Stanford Social Innovation Review recognizes that this is a complex world and a more-nuanced strategic model is needed. The article distinguishes between straightforward projects such as building a hospital or running an after school program and projects meant to get at the root cause of a problem. The latter being considered complex. This is where I parted company with the authors of this article. In my opinion, all problems that are intertwined with the human condition are complex. The issues dealt with in after school problems can frequently be complex. Or sometimes getting to a simple root cause like a child needing glasses can make a big difference. The concepts of this emergent strategy model can apply to a wide range of situations and that foundations and private philanthropists should be more flexible in the parameters they set for nonprofits. This model can work for many nonprofit programs. And there is no need to throw the baby out with the bath water. 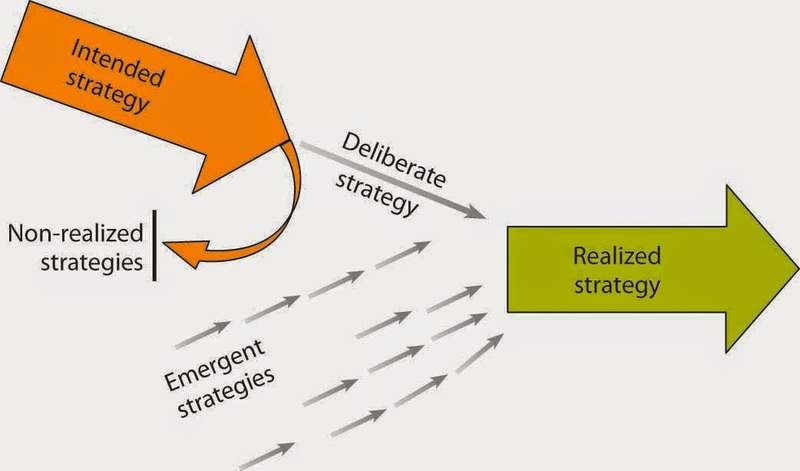 The current strategic model is the base that it is built on. Nonprofits start out with goals and develop strategies and programs to achieve those goals. Through assessments and evaluations they frequently learn that they need to make adjustments. This should not be seen as failure to meet goals but rather “unrealized strategies” exiting and “emergent strategies” entering. This happens every day. Rather than the linear model often purported by logic models this more flexible approach is more akin to the model used in business and industry for years – it is the model of continuous improvement. That’s all it is – it doesn’t have to be sophisticated, complex, philosophical or whatever big word you like. It is simple and used every day in business and industry. I’m sure some of you are thinking so “system maps” will replace logic models. Yes, no matter what the model, accountability is here to stay. And there needs to be a framework for accountability. System maps it will be. Thanks. Marion, for distilling Kania, Kramer & Russell's somewhat complicated article and injecting some practical wisdom. Yes indeed , plans change and intelligent people (note "people" not systems, not strategies) are flexible and adapt accordingly. Thanks for the feedback. I agree that this article was overly complicated but I wanted to pull the "golden nugget" out of it.